..................with a bunk i don't think i've seen before. :? :| There were 3-4 guys standing on the other side of the truck so i didn't want to interrupt with a question. Anyone have any info.............or is it something i've just not noticed? :? Front lot at the Bordentown Petro today. Actually a pretty homely setup, IMO... The sleeeper doesn't match the cab at all. Unique looking, yes, but not exactly good looking. :roll: Excellent catch, though, Charlie! Diane and I know that sleeper well since we were the ones that first ordered it from Bentz (now out of business) who built it. 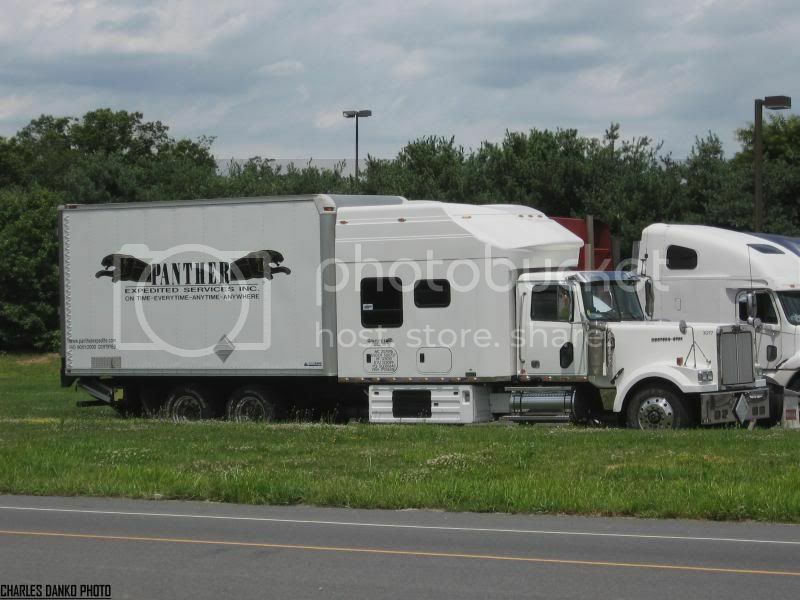 It was to have been part of a custom truck we ordered at the time but poor vendor coordination turned the project into a disaster at several levels, such that the finished product was illegal to drive and flawed in so many ways that we saw little choice but to cut our losses, forfiet our deposit and refuse delivery. Hell, one vendor screwed up so bad that he literally forgot to order the truck body, throwing the project into disarray and leaving everyone else stunned. It got ugly among the vendors after Diane and I left that wreck behind and moved on to order a new Volvo cab and chassis, new ARI sleeper, new Kidron reefer body, new carrier reefer, new liftgate from a different dealer and a host of other items that went onto the truck we put on the road in 2006 and continue to drive today. It took a year to build the second truck but the project was a success partly because we gave no discresion to vendors and we inspected the truck every major step of the build. The disaster truck was dismantled and the sleeper sat on a lot for many months before someone picked up (presumably for a song) and put it on the truck you see pictured above. The sleeper was originally designed to mate with a Volvo day cab. How they got it to fit onto a Western Star, I have no idea. I could say a great deal more, but I'm trying to be polite. Pictured below is that sleeper on on the first truck; a truck that we never drove and was not even licensed before it was scrapped.